The bungalow has about 150 square meters of living space and is especially suitable for families with several children. A large living-dining room with about 60 sqm. Hall and living-dining room are provided with stone floors (marble and terrazzo) the rest of the rooms is tiled. Three bedrooms with a total of 6 beds and a sofa bed for two persons, as well as two bathrooms each with a shower and toilets, guest toilet. 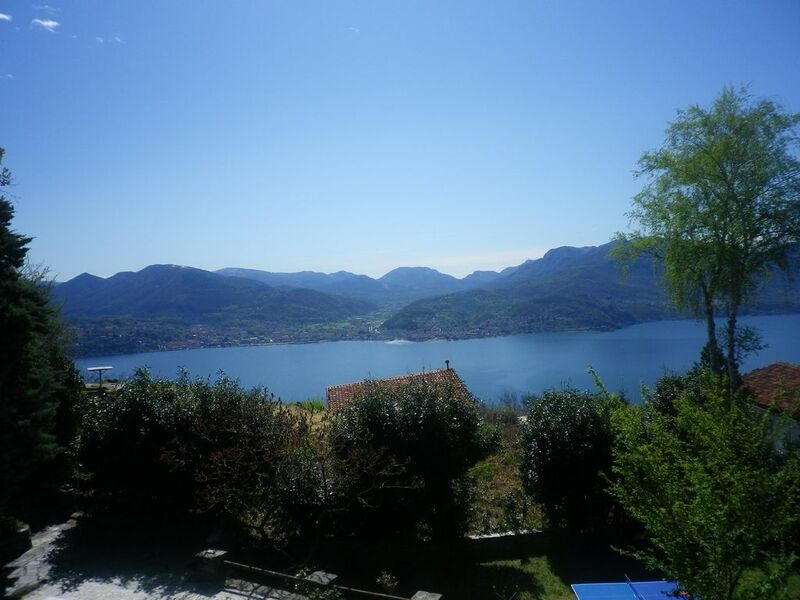 All three bedrooms are located back to the garden and have a magnificent view of Lake Maggiore, the nursery even has its own terrace. The kitchen contains everything you need from a large fridge, dishwasher, microwave to gas stove and electric oven. Through a small hatch, you can put the food directly into the adjacent dining and living room with fireplace. This is very spacious and has large windows with lake view. To the L-shaped living room is another area where you can read as well as work. Large glass doors lead from the living room to the large covered stone terrace overlooking Lake Maggiore, where you can eat and sunbathe comfortably. From the terrace, a stone staircase leads to the large, multi-decked garden with a large green area, where you can play badminton or other activities. From the meadow you can jump into the adjacent large pool (8m x 4m). There is also a large bunker where you can play table tennis, a large driveway and garage has the house. Overall, the property has about 2300 m². On one side is the forest, on the other side another house, which is barely visible behind a hedge. The house is about 400 m above the lake level on a small road that curves up the mountain and leads up to three small and very picturesque places, where it ends. The lake is about 5 minutes by car. Cannero is one of the most beautiful smaller towns on Lake Maggiore with a fairly large clean beach with boat rentals and two bars / restaurants. You can also go shopping in the next town Cheglio (about 2500 m). There is a small shop there. There are two restaurants on the way to Cheglio. In Cheglio on the street there is a bar with sun terrace. Wir buchten leider nur 10 Tage in dem sehr gut ausgestatteten Haus. Es fehlte uns an nichts, alles war gut beschrieben. Toller Ausblick auf den See. Morgens wird man mit Vogelgezwitscher geweckt und riecht den herrlich duftenden Lavendel vor der Balkontür. Traumhaft! Trotz anfangs enger Straße gut zu erreichen. Haus steht an mäßig befahrener Straße, von dort hört man etwas Autolärm, aber kaum störend, da alles Richtung See ausgerichtet ist. Ca. nach 50 Metern kann man mit seinem Hund einen Feldweg entlang Gassi gehen. Zum Essen gehen zu Fuß leider weniger geeignet, da Straße keinen Fußgängerweg hat. Sehr gute Restaurants sind aber mit Auto in weniger als 5 Min. zu erreichen. Für kleinere Kinder unter ca. 3 Jahren nicht zu empfehlen, da im Garten nicht überall Geländer vorhanden sind. Gute Ausflugsmöglichkeiten, z. B. mit Boot nach Luino oder mit Zug nach Mailand. Das Örtchen Cannero ist sehr liebenswert, hat kleinen Supermarkt, eine Bar mit günstigem Aperol, gutes Eis, sehr schönen und kostenlosen Strand und Strandpromenade mit vielen Restaurants direkt am See. Alles sehr gepflegt und sauber. Tolles italienisches Flair!